Try this Homemade Enchilada Sauce for your next Mexican night. It’s super simple and made from ingredients you probably already have on hand. Plus it’s WAY better than the canned version & much lower in sodium! I’ve been thinking about making my own Enchilada Sauce for a while now. We eat a lot of Mexican food in our house and we like it spicy, but I hate buying the canned version because it’s so high in sodium. This sauce was inspired by this recipe and this recipe. It’s made with just a few basic ingredients and it’s so good! You can adjust the amounts of cayenne and chili powder to get your desired spice level! 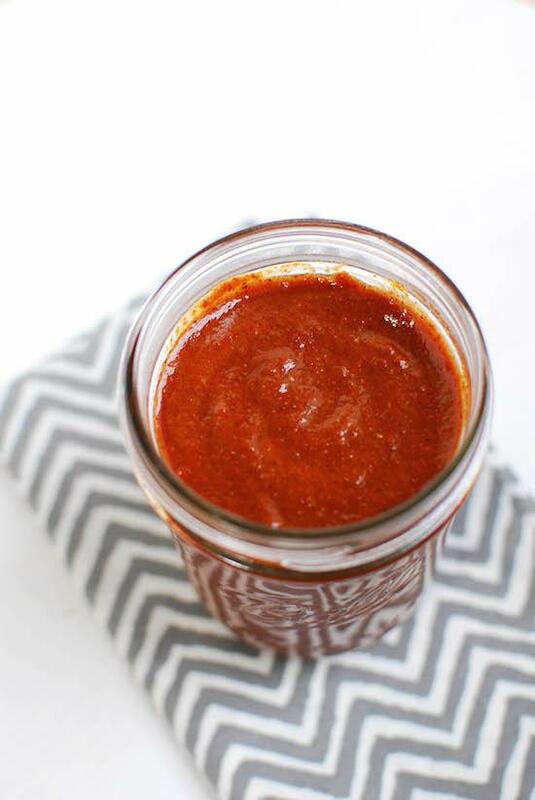 An easy homemade Enchilada Sauce that’s healthier and more flavorful than store-bought and can be made with just a few ingredients! Stir in flour and mix until combined. Add remaining ingredients, bring to a boil, reduce heat and let simmer for about 10 min. Taste and adjust spices as needed! Look for tomatoes where the only ingredient is “tomatoes”. Tomato sauce will be a little thinner, crushed tomatoes will be a little thicker. [br][br]Start with less spice (chili powder and cayenne), then taste and adjust to your liking. You can also add more sugar for a sweeter sauce. So easy right? You’ll never want store-bought again! This makes about 4 cups and you can store it in the fridge for a week or two! 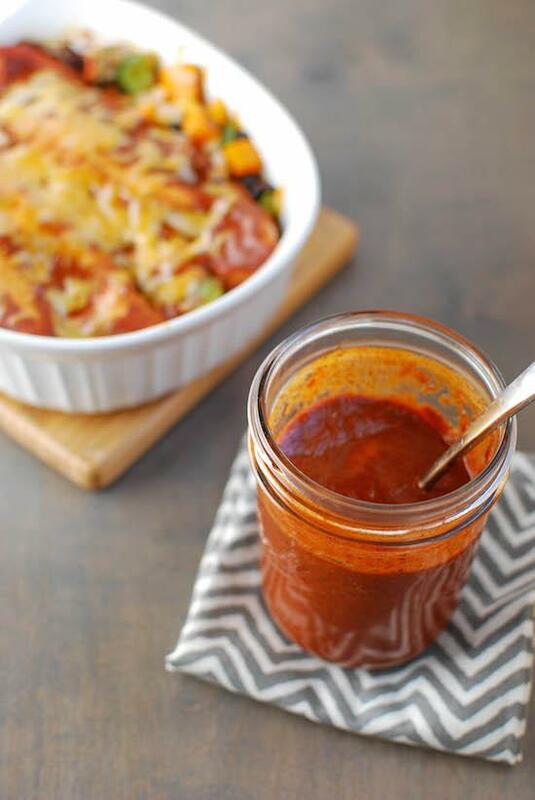 This Homemade Enchilada Sauce from @leangrnbeanblog is WAY better than storebought! I love enchiladas. I’ve made a few sauces- a verde, a mole and a ranchero but the red sauce was a bit more complicated using dried peppers and I don’t see myself doing it again. I like the simplicity of this. Need to try it! agreed! already planning what to use it on next! I’ve been craving enchiladas for a week and this totally hit the spot. I’ve printed so many of your recipes and bought s binder at Staples today to organizate them. I’m mamaswags02 on Instagram and Twitter and follow your posts. I’m on chemo and you have really helped me put nourishment into my body and my family’s bodies as well. I just wanted to thank you. It’s cliché, but you really have changed my life for the better by making it fun to chose healthier foods. I can’t workout due to weakness right now, but I can chose what I put into my body. You’ve shown me that. I’m here to stay. thanks so much for reading! best of luck to you with your treatment and good for you for making nutrition a priority! That’s brilliant! Plus, I’m much more likely to have those ingredients on hand than I am enchilada sauce. It would also be great to freeze some for later as I know I never go through my bottle fast enough. genius! freezing some next time! This is perfect Linds- Enchilada sauce is MIA. Pinned! yum! mexican food is my FAVORITE! love this! and gorgeous pictures, as always! I started making my own sauce a few years ago. It’s so easy and so much flavor. Yum! i can’t believe i’ve waited this long! Your blog hates me….what I was trying to say was…I’d pour this bad boy on more than just enchiladas! DELISH! agreed. it would be delish on lots of things! Awesome- I totally agree about the canned versions but I never had a good quick and easy recipe to use in place of them- now I do! 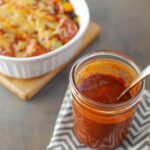 I have never seen a recipe for enchilada sauce so this is pretty awesome! can’t believe it is soooo easy to make! i know! will def make me think twice about buying the canned stuff again! Awesome! Thank you for posting this! I have been wanting a good enchilada sauce recipe…the sodium on the canned stuff is pretty scary but I have not found another way yet 🙂 Pinning! woohoo! hope it’s a hit! This is great! We eat a lot of Mexican in our house, too, and my husband basically refuses anything that doesn’t have a sauce on it. I, too, hate buying any store versions because of all the added preservatives so I’m excited to try this! yay! hope you guys love it! I have to make this!!!! After making my turkey pumpkin cranberry chipotle enchiladas for Thanksgiving and then having them 5 of 7 nights (very much by choice, thank you), I needed a little bit of a break. This is enough to get me back to it! Bring me a glass of water! That cayenne pepper will definitely qualify this recipe as “HOT!” It’s hard to find an all-natural enchilada sauce at the market, so thanks for the recipe. you’re welcome! let me know if you give it a try! I usually make enchiladas verdes, a sauce that is so easy to make…but I’ve never done a red enchilada sauce. That looks equally easy and I’m sure so much tastier than from a can. Pinning! Sounds awesome! I am always wary of enchilada sauce from the store. Everything tastes better when it’s homemade! Enchiladas are so good, but for some reason I never make them at home. I might have to try it now though. yes! they’re a staple at our house! Ok, so if I made this, it would be the most homemade thing about my enchiladas. I use premade tortillas, an archer farms pineapple-black bean-quinoa filling, pre shredded cheese, and pre-mixed (by me) taco seasoning in my meat. If I top it with this sauce, I WILL be calling the whole thing homemade. You are speaking my language! I love enchiladas and so do my kids! This is awesome… must make! I’ve never tried making my own enchilada sauce. Time to change that. 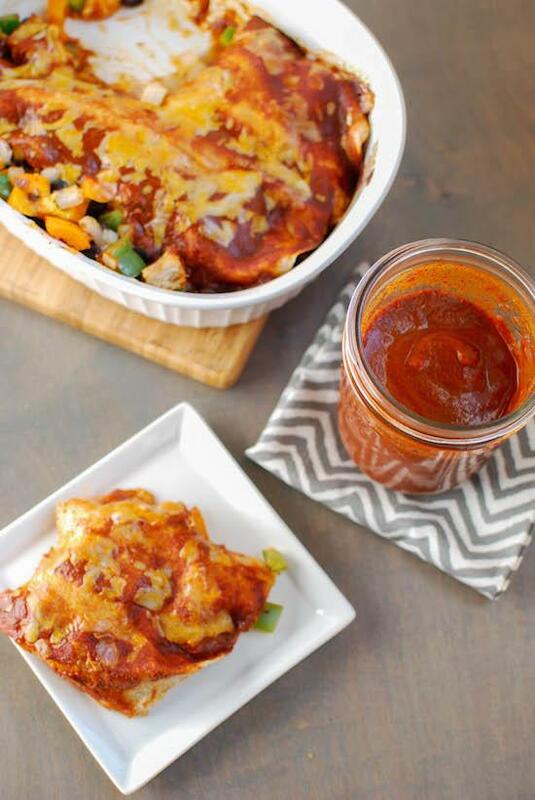 I had no idea enchilada sauce was so easy to make… and I do have everything on hand! Yay no more store bought sauce, this is awesome, Lindsay! Hi Lindsay! This looks great! I totally had the same thought last weekend and made my own too! Its so simple and such a great alternative to the sodium laden store bought jars! Nice work! Homemade enchilada sauce has been on my list for too long. I always cop out and buy a can instead. I need to just make a big batch and can it! great idea! i need to do that too! This was wonderful!! I needed a low sodium enchilada sauce (typically I use a canned brand). However, due to trying to accommodate the dietary needs of others, I searched and this was the first recipe I located. I opted for no sodium chicken stock and no salt tomato sauce. Very easy to prepare and everyone cleaned their plates. I made this enchilada sauce using fresh tomatoes from our garden. It was perfect. I used shredded pork roast for the filling. I am going to share your recipe with a friend who is also having a late harvest of tomatoes. October warm sunny days here in northern California. Thanks for posting your recipe.